A while back I was with an MSP/IT specialist at one of our clients. He knew us as the "printing consultants" hired to help them with their print policy, cost reduction processes, etc. and was our guide for the day. For him, we did not fit into the sales person model and he was unaware of our copier heritage - in other words, he was candid and open about his feelings around printers and copiers - from the IT side of the yard. Well, as with most conversations, we started talking about service calls, toner delivery, managing user behavior, and his observations of the decreasing need for print. I ask if he's ever looked at managed print services. "Everybody is trying to force MPS into the MSP environment. The guys from Kaseya and Connectwise are always pushing MpS and to tell you the truth, the biggest reason we don't want to get into MpS is the pushy sales people. We don't conduct business like that with our clients. We're not salesy like those copier guys and our clients don't want to be sold." Know this, we did not coax him into a response nor did we agree or disagree until he was done venting. He confirmed printing and printers really aren't all that important or carry that much interest in the eyes of most IT people - nobody likes copiers - and besides, "they are all going away anyway." Look at it a different way: this client is currently working with two major OEMs - there are thousands of devices and hundreds of sku's. Both OEMs have formidable managed print services offerings and vertical industry solutions: the account generates millions of dollars in revenue for both, yet the customer holds each in only the slightest regard. "...and our clients don't like to be sold..."
The imaging industry is known for its sales prowess. For whatever its worth, copier folks are more deft at managing the selling cycle than managing services. The ability to bury cost in the lease, lock the customer, increase share of wallet and automatically increase pricing has been part and parcel of the industry's selling playbook. 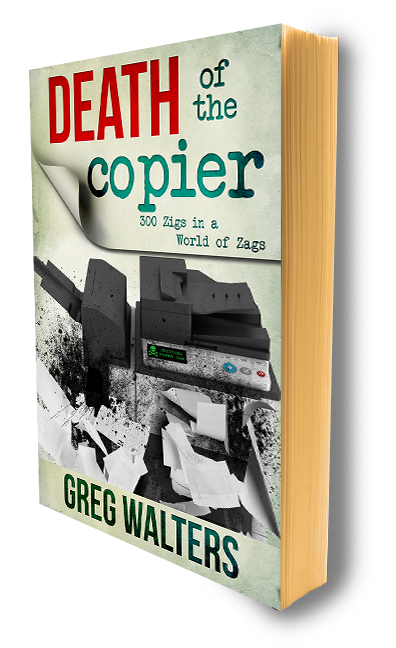 Thousands of copier zombies inhabit the landscape regurgitating the, "same cost, better, faster, newer technology" value proposition. Yet given enough time, one's strengths evolve into weaknesses: IBM was the mightiest server manufacturer at one time, no longer; Microsoft determined the world's desktop computing experience, not anymore; HP's printer division was the cash cow, now it's an anchor. So perhaps this is where we are today. The talents of yesterday align more with the needs of our masters, less to those of our clients. You are paid to move a box, NOT solve a problem. Customers want solutions to their problems. Unfortunately, customers understand copiers don't solve all that many business problems anymore, if they ever did. Greg you are usual dead on the idea that box droppers can still be relevant in today's business environment is shallow thinking. Talk Managed Services - "Lost Stars"
Does Good Workflow Get Rid of Machines?